I mentioned before in a previous post how I'd like to decorate my living room/office space in peacock colors. I just love how the colors blue, green, yellow, black, white and even brown and purple all look together. Well, I just found THIS picture through House of Turquoise's post on Turquoise Sofas. Isn't it beautiful? 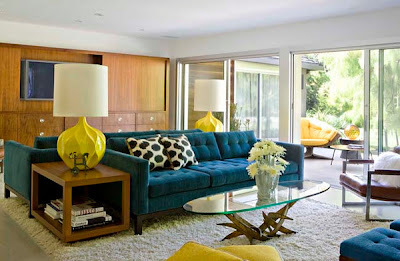 Of course, I'd probably have white walls and floors with white accent furniture but I love the yellow lamps here!